This episode's highlight was the group reward. It played out spectacularly well because of not one, but two twists layered over top of each other. Partially, also, it was classic sleight of hand. The twist combination worked because everyone's focus was directed to the distracting element—Joe deciding the order in which people ate, and each person then deciding how much to eat, and how much to leave for the others. Had the twists ended there, this would have been somewhat interesting. This was, obviously, a group of starving people, playing a social game, and some members of the group held grudges against each other. It's not terrible, although the highlight would likely be someone (probably Cole) behaving badly. Maybe we were primed to be under-impressed by Devon's reaction ("I don't like that") when Probst announced it. Thankfully, however, that initial surface drama over portion size and the fairness of the eating order was not the final product, but rather the ruse to conceal the real twist: an idol clue printed on the shared plate from which everyone ate their spaghetti. A clue that was gradually revealed as more and more of the spaghetti was consumed. This simple added element worked wonderfully, because it added so much insight into how people think, and how quickly people switch from notions of fairness to abject, self-interested competitiveness. An exceptionally well-conceived twist, and one which produced some of Survivor's most interesting, novel footage yet. 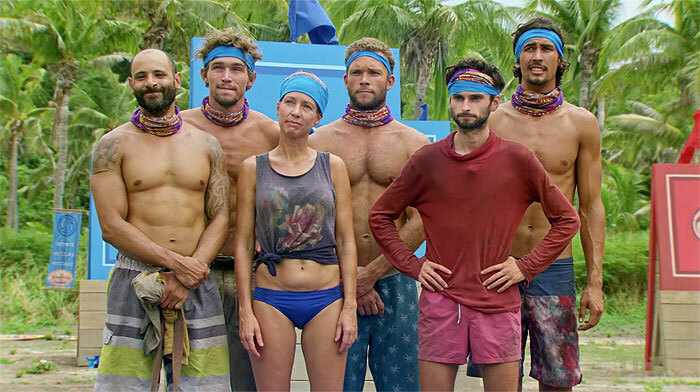 The scene continued to pay off back at camp, because now with three people (Cole, Chrissy, Ryan) armed with knowledge of the idol's location, all were internally torn between trying to act casual and racing to the tribe flag to dig up the idol. 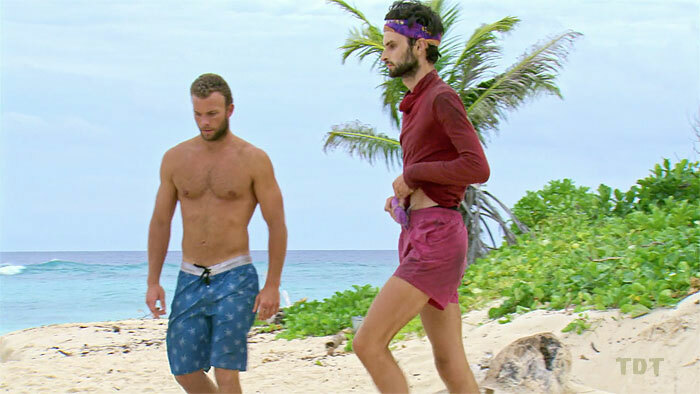 Ryan's quick thinking polished off the sequence—Ryan rapidly dug up the idol while Cole wandered off to pee, then offered bemused commentary in confessional while he watched, idol concealed in his pants, the near-brawl that ensued when Cole raced over to prevent Chrissy from finding the idol. An idol, importantly, that was no longer there. It's impressive that Survivor can still find unique, surprisingly real moments like this, 35 seasons in. Maybe it was partly luck. Maybe with a different set of contestants, or if the same group had eaten in a different order, this wouldn't have worked as well as it did. But we're glad they tried, and doubly glad they succeeded. An obvious guess is that the people being given these key, rotating Chief Narrator positions are important players in the endgame, and they're being given this extra level of attention so that the audience has an even deeper understanding of their approach to their game, how/when they controlled it, their résumé. Or maybe it's just a stylistic affectation, since the now-departed Ali also seemed like at least *a* central narrator early on this season. Whatever the case, we're not complaining about it per se, just pointing out that it's new, and different, and perhaps demands the audience provide a little more conscious thought as the season's "story" changes from episode to episode. Which isn't a bad thing, by any means. I's just not generally done on a primetime network TV show. For a season that has so many clearly defined characters—Lauren the straight-talking fisherman, Ben the affable-but-determined Marine, Chrissy the numbers/strategic whiz, Ryan the superfan, Joe the chaotic hellraiser, Dr. Mike the underdog—we're still confused as to who Devon is, and what his role is in this season. He's had a lot of odd moments. What do they all mean, together? In the opening episodes, Devon was almost exclusively Ryan's sidekick: "I only smile when I talk to you (Ryan)," but at the same time, he was also giving voice to positions that Ryan would eventually adopt, like booting Patrick. 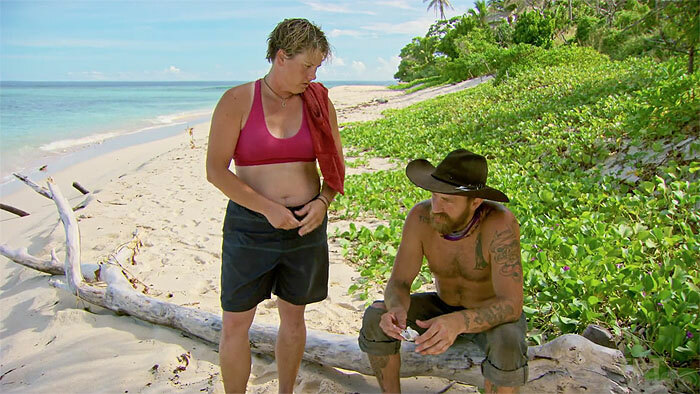 At the swap: Coming across as a white-hat straight shooter, objecting to Joe's sketchy fabrication that Alan and Ashley wanted to vote Devon out. Followed by his deadpan "This is not an advantage" at Tribal. At the merge: Suddenly presented as a strategist, bringing Lauren into the larger Heroes/Hustlers group, then tossing out Jessica's name as Plan B. In this episode: calmly doing yoga as Mike frets that at the previous Tribal, he thought his game was over. 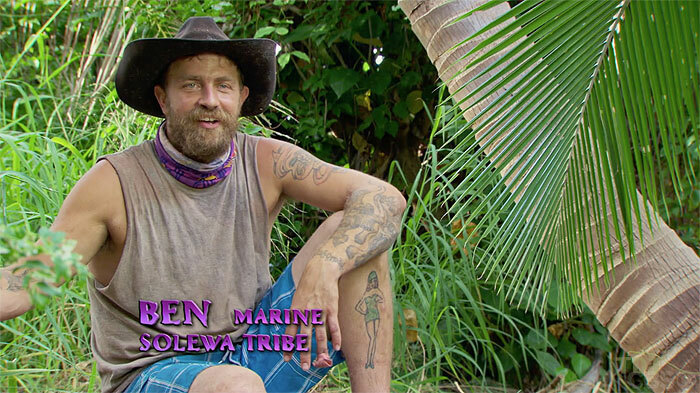 During the idol digging free-for-all, being the voice of righteous indignation as the tribe flag almost falls on him (absent a great save by Ashley): "You guys just about killed me! All for an *idol*!" Finally, he capped it all off at Tribal, with his stream-of-consciousnessing about not wanting to be a zombie. In a season where the edit has been dominated by serious, committed players like Lauren, Ben, Chrissy, Ryan, Joe, and Mike, it's hard to take Devon's overly positive, slightly goofy demeanor seriously. Rarely do we ever hear Devon talk about his long-term goals in the game, nor how he plans to achieve them. In fact, if not for the merge (and the episode where he was vote-blocked), he's barely talked about the game. Instead, we see all these scenes where he's presented as an almost saintly character who only wants to do good things. And/or drink beer. He doesn't need to mess with those underhanded idols! Furthermore, it seems like the show is actively hiding some of his gameplay. Allegedly, he and Ryan jointly discussed where to send the Ep.1 Super Idol, and they decided on Chrissy. On the show, that decision was 100% Ryan. Devon is in the middle of everything, but he's being shown as not a part of it. It's a weird look, almost as confusing as the constantly changing post-merge POV. 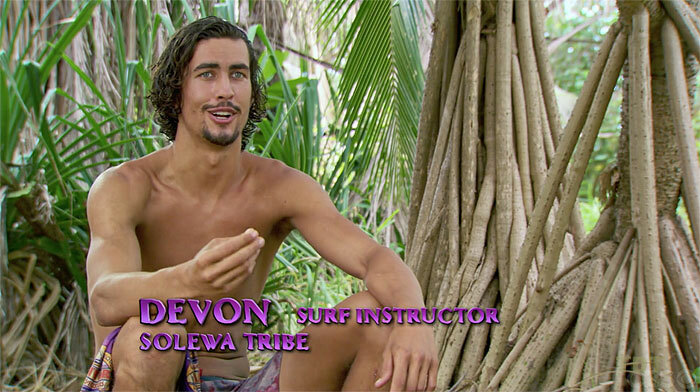 Edgic-oriented fans have apparently decided that this is a sign that Devon wins. Can't he just be a vaguely kooky mystic? Interactive data question(s): When is an idol an idol? As asked by one Ben Martell on twitter, and later followed up by chatting with Rob's Fact Checker during the week, with the advent of the Advantages All The Time era, we're starting to blur the definitions of some key pieces of Survivor data. More specifically, a question that emerged in this episode: Has Ryan now found one idol this season, or two? It's more complicated than you might think. To be clear, the one he placed in his little pink shorts this episode was clearly a regular hidden immunity idol. But what about the first episode's one? The Day 1 Super Idol was, at that time, a very powerful idol. It could be played after the votes had been read, and it could save anyone for whom it was played. But Ryan also had no opportunity to play it. Then, once Chrissy chose not to play it either, its official powers completely vanished. If an idol's power falls in Tribal and Jeff Probst doesn't hear it being played, did it ever actually exist? It's clearly not an idol any more, and it hasn't been played. To further muddy things: when it found in the first place, its outer wrapping said "Secret Advantage." It was both a temporarily super-powered idol, and one that had no actual power to save the person who found it when he eventually attended Tribal Council (just five days later). So in our list of career idol finds, should Ryan be credited with finding two idols, or just one? Regardless of how you view that specific data point, what about the Legacy Advantage? It functions exactly as a hidden immunity idol does, in that it cancels out votes against the person who plays it, and it must be played after the votes are cast, but before they're read. But it's also less powerful than an actual hidden idol, because of its timing restrictions: In MvGX it had to played at the F6 Tribal Council, in Game Changers it was the same, but could also have been played at the merge (F13). Because of that, it's useless except at those specific times, and also can't leave the game in someone's pocket, as James Clement's two idols did in China. It's a quasi-idol. A bit more than half an idol, but one that also carries far less prestige and utility than a fully powered one. Should it be counted as an idol, though? These are the things that keep us up at night. Important spoiler warning: The following section (which is the last this week) involves discussion of a leaked twist, which came out pre-season on Inside Survivor, but has never been officially mentioned in any of this season's CBS-sanctioned press. It's almost certainly true, it's just not widely known, and/or some may have forgotten that it's coming (and may prefer not to be reminded). So if you don't want to know, skip down to the links and/or comments below. Also: please don't re-discuss the twist in the comments. Okay, if you're still reading... here goes. Lauren's newly acquired extra vote could play massive dividends at the very end of the game. There don't appear to be any restrictions as to how late she can use it. So that means there are two key votes at the end of the game where it could be useful: Final six and final five. And each is key because of the new final four vote twist, in which the immunity winner picks just one person to save, and the third member of the final three will be whichever of the other two players wins a fire-making challenge. So final six and final five are the last two times it can be used. At final six, if Ben and Lauren still have one key ally (Mike?) around, they could instantly create a 4-3 majority with the extra vote, and topple an opposing three. If for some reason they miss that opportunity and both survive that vote, they get another shot at final five. There, an outnumbered Ben and Lauren, despite being down 3-2, could force a rock draw with that extra vote. This play would be 100% bulletproof if one of them also has immunity. So if Ben and Lauren can just survive four more votes with Lauren's extra vote unplayed, they're virtually guaranteed a path to the final three. That's pretty powerful. There's clearly a lot of game left to play between now and then. Maybe it won't even survive next week unplayed. But there are also a number of low-hanging big targets still around (Joe, Cole, maybe JP and Ashley), so there's no immediate rush. In theory, at least. Sorry once again, no vidcap gallery. Every other week seems to be about the right spacing for both advantages and vidcaps. Josh Wigler at The Hollywood Reporter: "How Survivor Cooked Up Season 35's Tastiest Twist Yet"
Stephen Fishbach at People.com: "Why 'Everything That's Not Expressly Against the Rules is Within the Rules'"
Andy Dehnart at Reality Blurred: "A twist of spaghetti gives Survivor: HvHvH its best episode yet"
Martin Holmes at Yahoo TV: "Scream if you want to go faster"
Gordon Holmes at XfinityTV.com (11/16/17): "Desi - 'I Don't Think (Chrissy) Is Well-Liked Inside the Game'"
Mike Bloom at Parade.com (11/16/17): "Desi Williams wins Miss Ponderosa"
Dalton Ross at EW.com (11/16/17): "Desi says she did not notice the missing vote"
Rob Cesternino at RHAP (11/16/17): "Exit Interview #8: Eighth Boot from Heroes v. Healers v. Hustlers"
Rob Cesternino & Stephen Fishbach at RHAP: "Survivor Know-It-Alls | Ep #8 Recap"
Rob Cesternino at RHAP: "Episode 8 Recap with Todd Herzog"
Dwaine Stroud & David Jones at Survivor Talk with D&D: "Episode 8 Recap & Feedback Show"
Andy & John at The Purple Rock Podcast: "Playing with the Devil"
Dom Harvey & Colin Stone at the Dom & Colin Podcast: " -- Episode 8 Recap/Analysis"